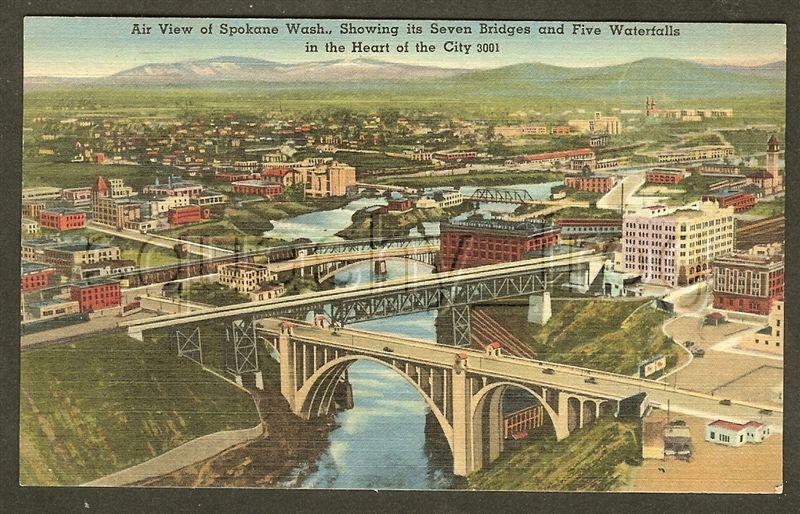 This is a postcard of downtown Spokane from the 1940's picturing all the waterfalls and bridges our city is famous for. The big bridge in the foreground is the Monroe Street Bridge. It is a beautiful engineering marvel. It was designed by Kirkland K Cutter and John C Ralston. I don't know much about Mr. Ralston but Mr. Cutter was very famous for the design of some of our most prestigious buildings. I will post more about him at a later date. The bridge was restored in 2003 and reopened in 2005. It was rebuilt in keeping with the original design, looking much as it did in this photo yet stronger. It is beautiful. I marvel at the engineers over time who have touched this bridge from its beginning through today. Spanning above the bridge and throughout town we had many railroad trestles to carry the trains along through the city to regions for commerce and leisurely trips across country. In addition to a rich mining history and agriculture, our town was a railroad town and the railroads were a major employer for many years. In addition to the overhead traffic, train tracks lined the streets. I grew up less than five miles from a major rail yard in Hillyard, there weren't many routes to take downtown where I could avoid at least seeing or hearing a train every day. My mother always said, "You lucky kids, You get to see a train!" To this day that is how I feel when I see one. I rarely have to stop for a train these days as most of the trains have gone. I think I would like to keep remembering that piece of our history lest we forget how so many people came to Spokane. In the far right top of the postcard there is a clock tower that was part of the old Great Northern Railway depot. We picked up visitors and some of us departed from that depot. 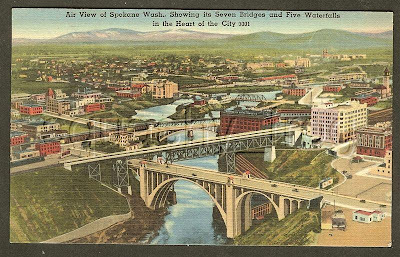 In 1974 Spokane hosted Expo '74 and in preparation for this, this central area near the river was revitalized. The trestles went away and the train depot was torn down. Only the Clocktower remains as a reminder of the glory days of the railroad. 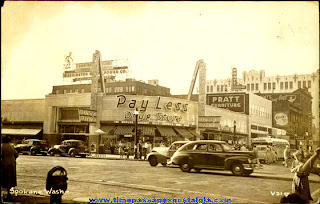 Here is a look at downtown Spokane Washington on the corner of Main & Post. 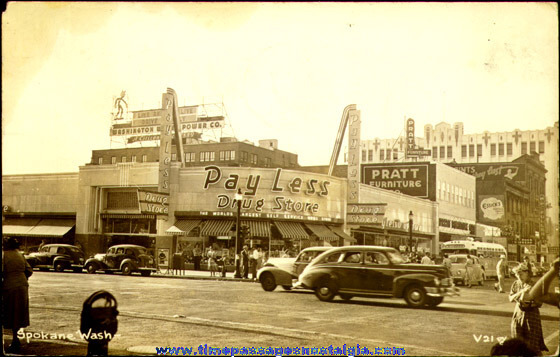 This postcard was taken many years before I was born judging by the cars but what a sight it is to see the old Pay Less Drug store, a favorite haunt for my mother. She bought her Breck shampoo there and browsed the sales. She loved the after Christmas sale and purchased cards for the next year. It is easy to spot the Pratt Furniture Store, a long time business downtown. My husband and I bought our first pieces of furniture there on their installment plan. It was a dinette set with chairs. Across the street from the furniture store was the Post Street Theater. One screen and they had ushers who made sure you minded your manners. The theater some times held the Children's Theater's live plays. Further down is the old Montgomery Ward's store. It is an Art Deco-styled building that has been restored and houses our city hall. What fun it is to visit days gone by in pictures unchanged and still as good as the days you last visited. 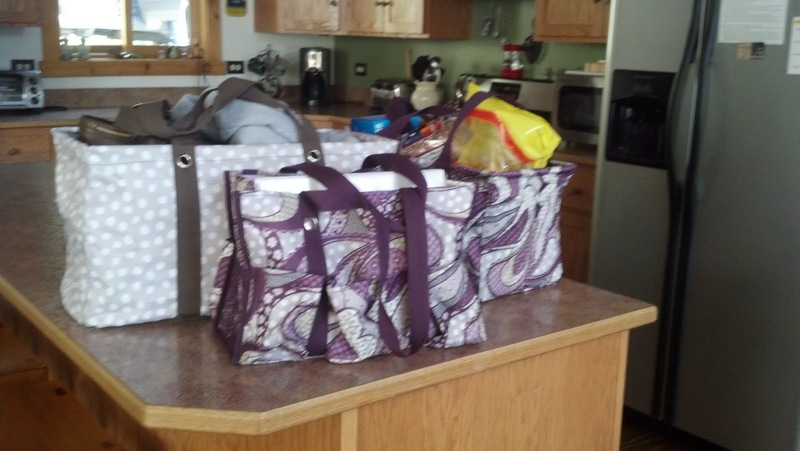 I am getting so organized with my Thirty-One products. It is an incredible feeling for this woman who can attract clutter on a dining room table in a heartbeat. More than this though is how much fun I am having with my products for travel. No more paper bags full of groceries ripping on the way to the door the cabin. No more wimpy re-usable bags to flip and spill in the back of the car. 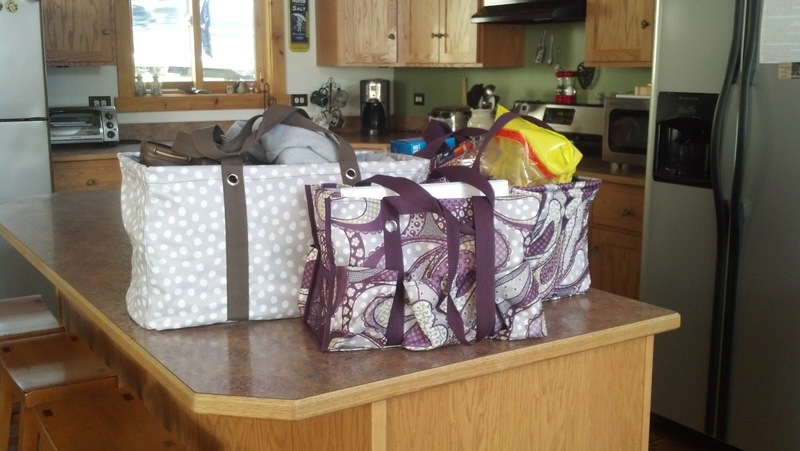 Look at how nice and neat the totes sit on the counter at the cabin! 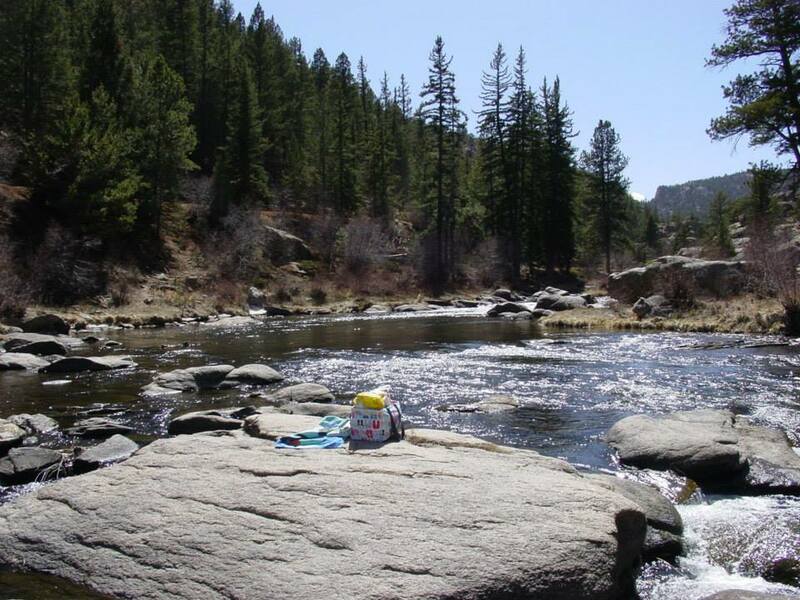 Taking the Large Utility Tote along for a day out fishing makes sense too. The large straps make it easy to secure your goodies while navigating to that perfect spot. Ah I can just feel the sun on my face and know it is going to be a relaxing day out. This is a picture my friend took on her trip to the ocean. I can't wait until my vacation because I will be using mine for the same thing when we take our grand-kids to the ocean. Beach towels, sunscreen and plenty of snacks in one of our thermals. What could be easier! I am so happy that I decided to venture into the Direct Sales business. For this baby-boomer, it is a welcome relief from the corporate world. I love the flexibility. I love the variety of products available and being first to know what is coming out in the new season. 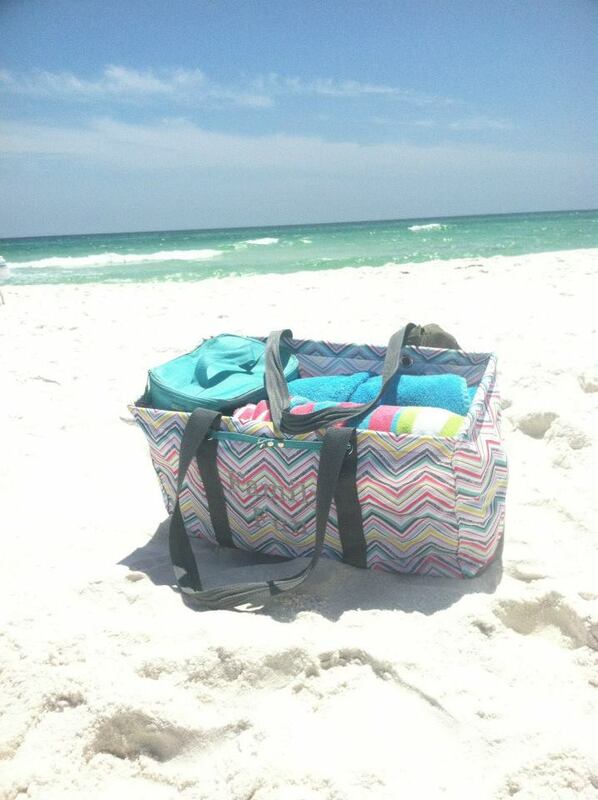 I had no idea that my Thirty-One business would be such a pleasure. I enjoy meeting new people and the products are amazing. Every month there is a special that is tremendous savings. My customers eagerly await to see what the next special is so they can continue on their quest to make their lives simpler and organize their homes. Here are two of my Large Utility Totes. They are filled with food and miscellaneous items needed for a recent trip to the lake. It is much handier than taking bags that can slip, rip and not adaptable to the odd shapes we take along. The bags are sturdy while light-weight. This trip we also took one along loaded with books, shoes and my toiletry bags. The tote is so versatile that I have one in the back of the Jeep when I go running errands. We put one in the back of the car for trips to corral items like sand buckets for the grand-kids. I have one in my guest room closet with the lid that is also available to store off-season sweaters. My husband is on board now that he sees how many ways we can use these great Utility Totes. Change is not always easy for him but lets face it, if it makes life easier, the change is worth it. 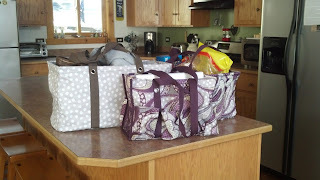 The bag in front is an Organizing Utility Tote that I take shopping and often as a road trip companion. It has pockets all around! I will tell you more about this amazing bag another day!